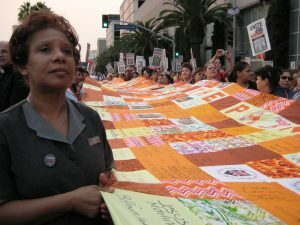 You are here: Home / Changing Lives, Changing L.A.
Union housekeepers carry a 60-foot long quilt. Each panel depicts a workplace injury sustained in LA’s hospitality industry. Spoken-word performance brings to light the struggle of Los Angeles hotel workers. November 10, 2016. 7 PM. Northwest Campus Auditorium. Workers in LA’s hospitality industry are often invisible to tourists, but they cook the delicious meals and keep the hotels clean so visitors can enjoy themselves. Now the lives of housekeepers, cooks, and bartenders will take center stage in an original spoken-word performance based on personal stories of rank-and-file leaders of the hotel workers union, UNITE-HERE Local 11. “Changing Lives, Changing L.A.: Hotel Workers Rising!” weaves together the stories of women and men from various parts of the world who found themselves struggling together to improve their lives as hotel workers. In the process, they helped to change the political and social landscape of Los Angeles. The original interviews were gathered during a collaborative research project involving UCLA faculty, staff, and students, community activists, and members and staff of UNITE-HERE Local 11. Director Judith Royer and playwright Doris Baisley place these stories in dialogue on stage with historic images from the union’s archive as a backdrop. The Public History Initiative is pleased to welcome this production by Loyola Marymount’s CSJ Center for Reconciliation and Justice to the UCLA campus. Admission Free. No RSVP needed. Paid parking in Sunset Village Parking Structure.